The #NextGenATP star from Greece will challenge Rafael Nadal in his first ATP Masters 1000 final. World No. 1 and three-time Rogers Cup champion Rafael Nadal will take on unseeded Stefanos Tsitsipas in the singles final of the ATP Masters 1000 event in Toronto. Nadal defeated Karen Khachanov of Russia 7-6(3), 6-4 in Saturday’s semi-finals. The 32-year-old Spaniard broke his opponent’s serve twice and won 52 per cent of the total points played to prevail afater one hour and 49 minutes. “I’m happy about everything. Of course, I can play a little bit better. I believe I can do it,” Nadal said. Nadal is seeking 80th career trophy and his first ATP World Tour Masters 1000 title on hard courts in five years against #NextGenATP star Tsitsipas, who rallied past No. 4 seed Kevin Anderson 6-7(4), 6-4, 7-6(7). The teenager saved all four break points he faced as well as one match point to secure victory in two hours and 48 minutes. “Four wins against Top 10 players. I would never imagine I would pull this out in a single tournament. “Everything is happening so fast, I can’t keep up. I mean it’s my birthday tomorrow,” said the youngster from Greece, who is turning 20 on Sunday. 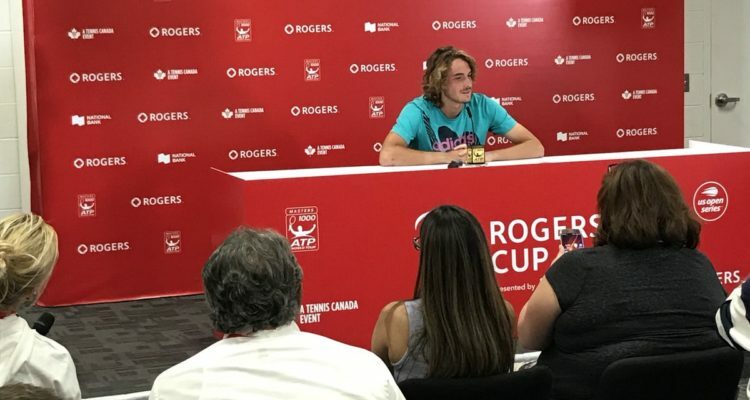 This entry was posted in ATP Masters 1000 Toronto/Montreal, ATP Tour and tagged ATP World Tour, Rogers Cup, Stefanos Tsitsipas, Toronto.